Embraer’s corporate jet division is located in Melbourne (FL). Hondajet is in Greensboro (NC). Pratt & Whitney manufacturers commercial and military engines at its West Palm Beach (FL) facility. Rolls-Royce tests commercial engines at NASA’s John Stennis Space Center in Hancock County (MS), an hour’s drive east of New Orleans. Mississippi has a growing aerospace footprint, including UAVs (Northrop Grumman), helicopter production (Airbus Helicopters) and a variety of other industries. Although Mobile is perhaps best known in aerospace for the Airbus FAL, United Technologies has a major facility here. ST Aerospace, now known as VT MAE, has long had a maintenance, repair and overhaul operation here. Maas, the European-based aircraft painting company, opened a paint shop next to the A320 FAL and already expanded its business model to take in work from non-Airbus customers. Since Airbus committed to Mobile, the city has commitments from 19 companies to locate here. It wants more. 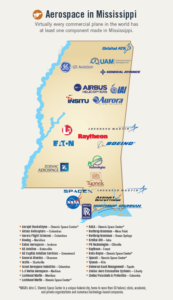 Boeing has a major defense facility in Huntsville (AL). And, of course, Boeing’s second 787 assembly line is located in Charleston (SC). 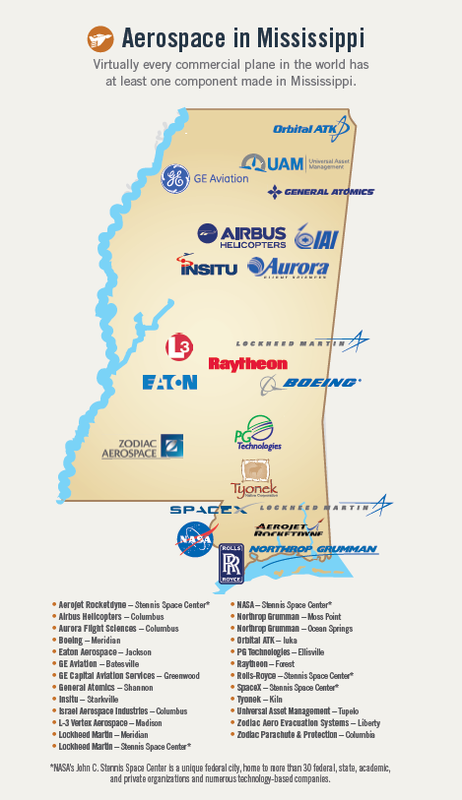 As LNC wrote yesterday, NASA’s Stennis Space Center encompasses not only rocket testing for Boeing, SpaceX, Blue Origin and other companies, Lockheed Martin, Rolls-Royce and even NOAA have operations here. The US Navy has a major presences at the Space Center. 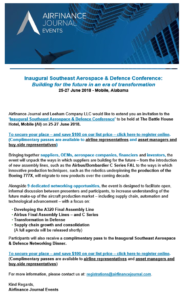 The SADC conference will focus on these established and growing sectors, bringing together a cross-section of the aerospace industries stakeholders. Leeham Co.’s Scott Hamilton was on the board of directors for the Pacific Northwest Aerospace Alliance for three years. During this time, PNAA’s suppliers conference expanded from 125 attendees and a small international draw to 450 attendees, an expanded program and a greater international draw. Today the conference has 650 attendees and it is now the largest conference of its kind on the US West Coast. 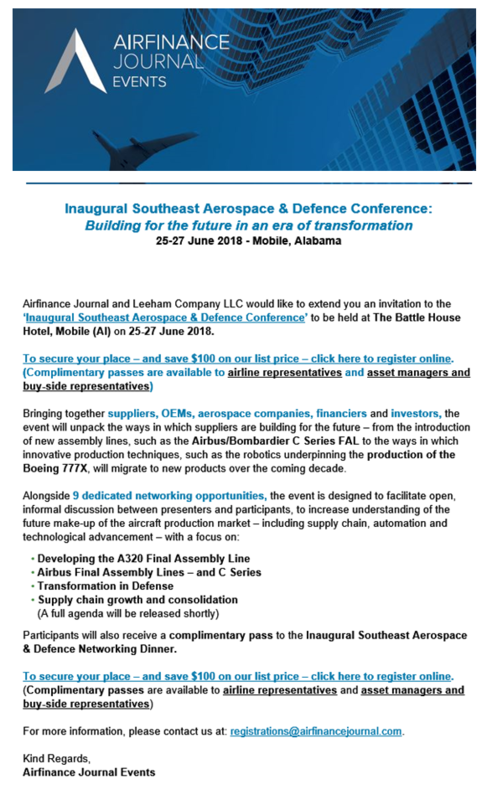 Taking this experience, Leeham joined with Airfinance Journal to create the SADC. The SADC will be anchored in the US Southeast, with Mobile its launch location. Airfinance Journal is the world’s premier aviation conference organizer, with nearly a dozen aviation conferences staged across the globe every year. Its first conference, in New York, will be 38 years old next year. Its Dublin conference in January is 20 years old. It has conferences in Hong Kong, China, Latin America and Korea, among other locations. The SADC is the first event co-produced by AFJ and Leeham. There will be more. Scott, it would be very helpful if you might comment on when this Airbus FAL achieves breakeven, and then “reasonable” profitability—say a 10% after tax return. Is it at 4 or 6 per month, for example? Thanks. Oh, and how big is Airbus’s investment—in euros or dollars? You write that 19 facilities have opened since the Airbus FAL. Care to expand on how many are related to it? You are talking about the number of PNAA attendees. How many attendees were at the SADC?